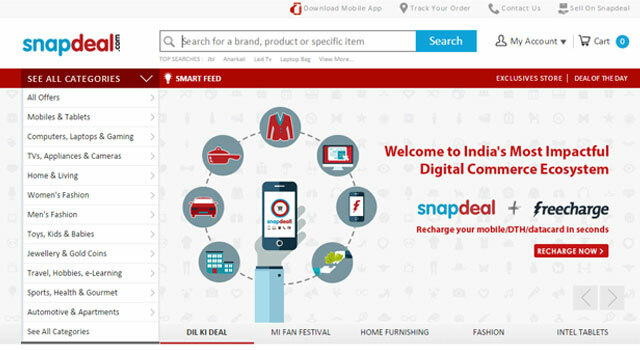 Online marketplace Snapdeal raised $500 million (Rs 3,250 crore) in fresh funding led by iPhone manufacturer Foxconn, Chinese e-commerce giant Alibaba and existing investor SoftBank. Its other existing investors Temasek, BlackRock, Myriad and PremjiInvest also participated in this round, as per a press statement. Separately, e-commerce giant eBay said it has sold a portion of its holding in Snapdeal, 18 months after leading a $134 million funding round in the Gurgaon-based company. Snapdeal, run by Jasper Infotech Pvt Ltd, did not say if part of the fresh funding round went to eBay. Kunal Bahl co-founder and CEO, Snapdeal, said: "With global leaders like Alibaba, Foxconn and SoftBank, in addition to our other existing partners, supporting us, our efforts towards building India's most impactful digital commerce ecosystem will be propelled further, enabling us to contribute towards creating a Digital India." Snapdeal will use the money to expand geographical reach and enhance services in a bid to better compete with well-funded rivals such as US-headquartered Amazon and Bangalore-based Flipkart. The announcement confirms a previous report that said Snapdeal has raised $500 million, citing sources. eBay claimed that it will earn a "strong return" from selling shares in Snapdeal, without divulging details. "India is an important market for eBay, and part of our fast-growing APAC region. While we will retain a significant portion of our original investment in Snapdeal, we also have a strong, healthy business with eBay.inâ€¦" Scott Schenkel, SVP and chief financial officer of eBay, said in a blog posting. "Going forward we will focus on accelerating eBay's presence in India, and empowering customers through technology," he added. With the latest funding, Alibaba is now backing two companies (Snapdeal and Paytm) who are directly slugging it out for supremacy in India's consumer internet space. Few years ago, Paytm announced its foray into the e-commerce space, putting itself in direct competition with giants like Amazon, Flipkart and Snapdeal. However, Paytm's competition with Snapdeal is more pronounced now. While Paytm was among the first domestic internet companies to offer digital bill and utility payment services, Snapdeal caught up through its $450 million (Rs 2,900 crore) acquisition in April of mobile recharge firm Freecharge. Interestingly, Alibaba's top shareholder is Japanese internet conglomerate SoftBank, which is also the lead investor in Snapdeal. SoftBank alone pumped nearly $657 million in the online marketplace last year, becoming the largest investor in Snapdeal. Snapdeal has already raised $1 billion from SoftBank, eBay, BlackRock, Bessemer Venture Partners, Kalaari Capital and Nexus Venture Partners. The Delhi-based company also counts Ratan Tata, chairman emeritus of Tata Sons, as a private investor.